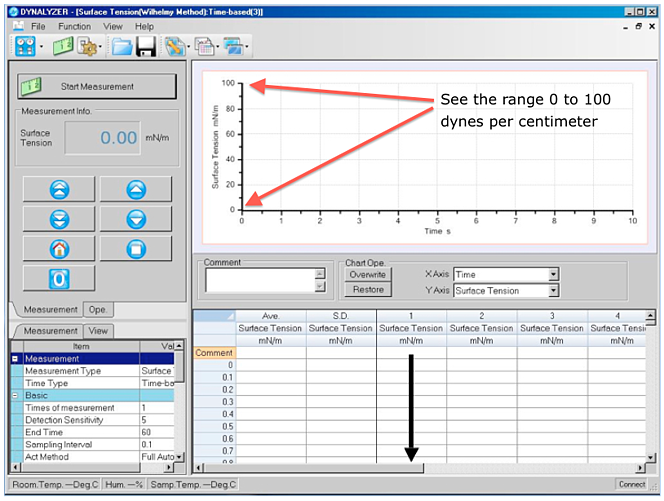 How many dynes per centimeter can a tensiometer measure? If your reading this post you probably already have an understanding of a few basic concepts. For those who missed it here they are for review. Surface tension is a measurement taken on a liquid and Interfacial tension is a measurement taken between/among liquids. I suppose it's worth mentioning why we decided to write this particular post about tensiometers and their surface tension and interfacial tension measuring limitations. The simple explanation being that people have continued to ask us the question! In fact, one time we had someone ask if we could recommend a tensiometer that could measure up to and above 500 dynes per centimeter! ...and we simply said "why?" and scratched our heads. I guess you could say we finally received enough inquiries about this to force us into action and write about it. If you have ever looked at a manual tensiometer guage like this one you will notice the dial only goes to 90 (90 dynes per centimeter). Why not make them with larger ranges? Up to this point you have seen a couple of examples of the range capabilities for a manual and an automatic tensiometer. The truth of the matter is that the dial on the manual tensiometer could be re-etched to include additional numbers going up much higher than 90. And the automatic tensiometers using the electronic balances could be configured and the software re-written to go as high as 1,000! So why haven't the engineers who make these tensiometers made the range on their tensiometers as big as they can? Wouldn't that make the tensiometer that much more appealing? A bigger range would mean you could measure more samples right? Well maybe...but not on this planet or in this universe. You see, the answer is not really about the tensiometer. In general, except for fluidic metals there are no known liquids that will indicate a surface or interfacial tension above 90/100 dynes per centimeter. Surface tension of Mercury for example is generally reported around 480 dynes per centimeter but it does not wet to either the Wilhelmy Plate or Du Nouy Ring and cannot be measured by a traditional tensiometer. Other fluidic metals need high temperatures and special atmoshperic conditions and are also unsuitable for traditional tensiometers. With the exception of fluidic metals just mentioned solutions including metal ions but excluding surfactants (e.g. plating solutions) indicate comparatively high surface tension readings of 80 to 90 dynes per centimeter at most. One of the highest surface tension liquids except Mercury is Sodium Chloride 6.0mol/20°C at 82.55 dynes per centimeter (mN/m). In summary then, we can conclude that all of the liquids we will encounter while measuring surface tension or interfacial tension with a traditional tenstiometer will fall in the range not to exceed 100 dynes per centimeter. Therefore restating the obvious you don't need a tensiometer that can measure surface tension above 100 dynes per centimeter. ASTM D971; Interfacial tension of oil against water: This standard is used to evaluate hydrocarbon fluids and possible contamination levels. Evaluating hydrocarbon fluid contamination levels is important in numerous industries including transformer oil testing and most Fuels. Our heavy use of petroleum products and the effects of hydrocarbon fluid contamination makes for an almost limitless list of applications that require testing. ASTM D1331; Solutions of surface-active agents: This standard applies to detergents and soaps but also includes emulsifiers and surfactants. The test method determines the surface tension of popular substances including diswasher detergents and laundrey soap mixtures in water. ASTM D1331 is broken into two separate sections based on the liquid mixture being tested. ASTM D1331 method A applies to aqueous solutions containing surface-active agents. It includes water with two or more surfactants added. ASTM D1331 states that it "is also applicable to nonaqueous solutions and mixed solvent solutions." This includes electrolytes. ASTM D1331 applies to two-phase mixtures. Two-phase mixtures include a water and surfactant mixture containing air in the form of foam or bubbles. Two-phase mixtures include solid particles with the aqueous mixture. ASTM D1331 states "more than one solute component may be present, including solute components that are not in themselves surface-active." This allows for the surface tension testing of soaps when it includes artificial colorings, scents or skin conditioners. Surface tension testing methods do not change when multiple surfactants are included in the mixture. The popularity of these ASTM methods require users to perform many of these tests day-to-day and in the process find themselves in situations where they either need to have their tensiometer ring repaired or replaced. 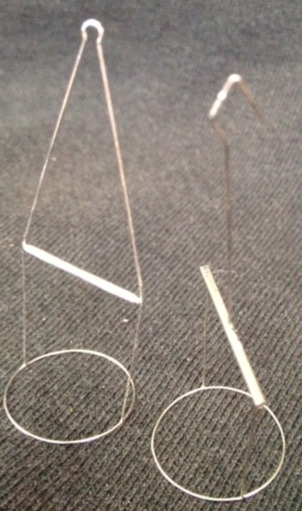 These platinum wire accessories while possessing a very high and durable melt-point can be damaged easily due to mishandling. Damaged tensiometer rings can effect results so examine the rings routinely and handle with care at all times. If you do find yourself in a situation where you need a quick repair for your Du Nouy Ring or need to find a replacement let us know. Hi, this is Hank Levi, and I wanted to take a minute to tell you about what we're doing to provide repair service and replacement of new Du Nouy Rings. We have been supporting operators working with popular manual and automatic tensiometers for about 10 years. It may have been a result of the day-in and day-out working with these tensiometers that led us to where we are today...but it all started about 3 1/2 years ago when we started repairing Du Nouy Rings as part of our service. About a year later we began providing New replacement Du Nouy Rings also. Since then we have found customers who have needed help with Du Nouy Rings from other tensiometer manufacturers as well. Last year Fisher Scientific stopped selling and servicing their tensiometers and with it their ability to provide Du Nouy Ring service. We also discovered that customers of other manufacturers including Kruss, KSV, Kyowa, CSC, SEO and a few others might have a need for our du Nouy Ring service support too. Well, the good news is that we are in the Du Nouy Ring business. We can repair or provide replacement rings for any brand of Du Nouy Ring on the market. This includes Du Nouy Rings for the popular Fischer Scientific Tensiomat, CSC Scientific, Kruss, KSV, Kyowa, SEO and more. Do you have a need to have a ring repaired? Or maybe you just need a new one. Or maybe both. Well we can help. Just submit your contact information so we have a way to reach you and tell us what type rings you have. We'll have someone contact you to review the details and if needed arrange to have your damaged rings sent in for service. If you know of another person or organization that could benefit from our service please don't hesitate to forward this information to them. Have you ever wondered about how surface tension is measured? Without getting into the details relating to things like, "What's a dyne per centimeter? 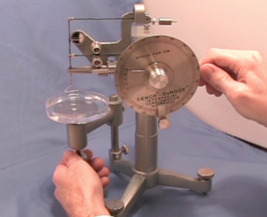 ", "Du Nouy Ring vs. Wilhelmy Plate", "the effects and force of gravity", "viscosity of liquid", or "temperature", we decided to put together this short video tutorial to help explain the main components of a popular manual tensiometer (70545000) and how the instrument works. We think seeing how a basic manual tensiometer measures surface tension is helpful in gaining a better understanding of the big picture. 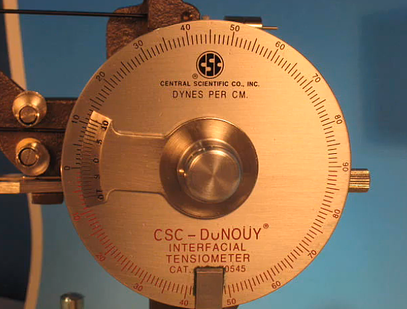 CSC Tensiometer Model 70545 Interfacial from Scientificgear on Vimeo. Industries using dye solutions, producing detergents, clarifying liquids, or sparating ores by the flotation process can obtain greater uniformity and efficiency through close control of surface tension of the process liquid. A close relationship exists between interfacial tensions of oil-liquid systems and the lubricating value of the oil. Another major use is determining the sludging condition within a transformer, thereby eliminating costly repairs.